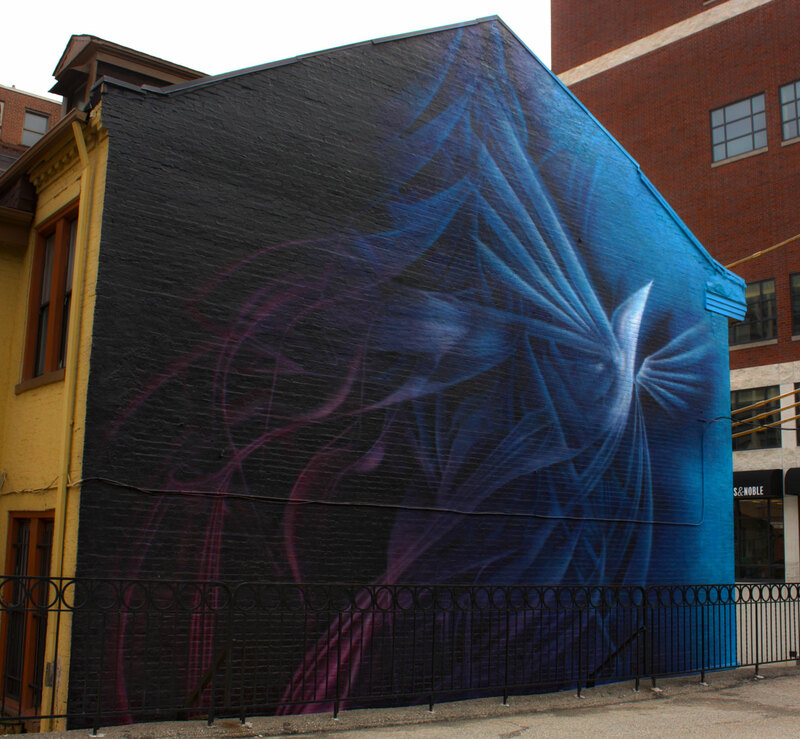 The location of this wall called for a completely different design than the 2011 mural. 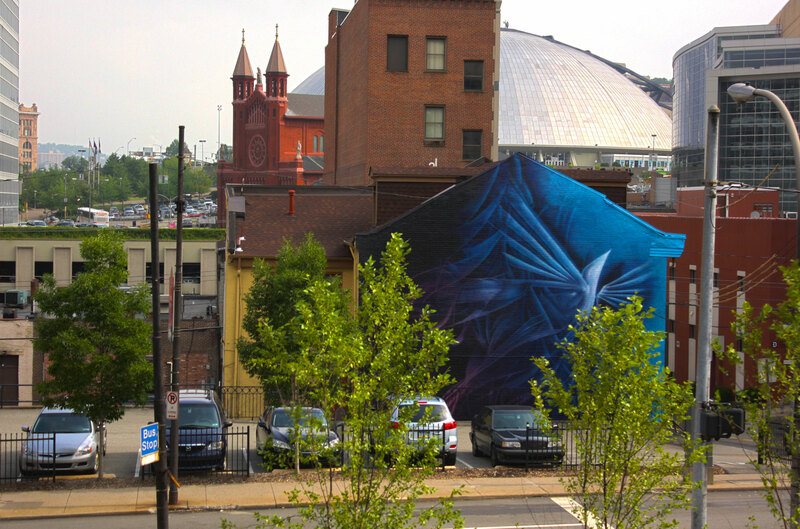 The wall is located across from the main entrance to the university on the corner of Forbes Avenue and Chateau Street in Pittsburgh. It is a very visible location on a busy street. There is a stoplight at the intersection and drivers can see the mural from their car at ground level. It can also viewed from Duquesne’s campus on top of the hill from multiple locations. With this much visibility, I felt it important for the design to be bold and dynamic in order to give it the most presence. 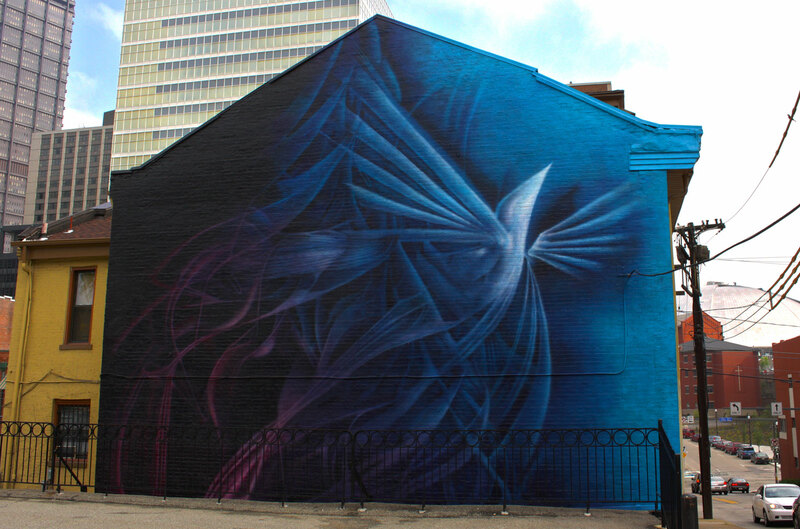 The only criteria for the mural was that it be “spirit themed.” Duquesne is a Catholic university and they wanted to work the Holy Spirit into the piece. 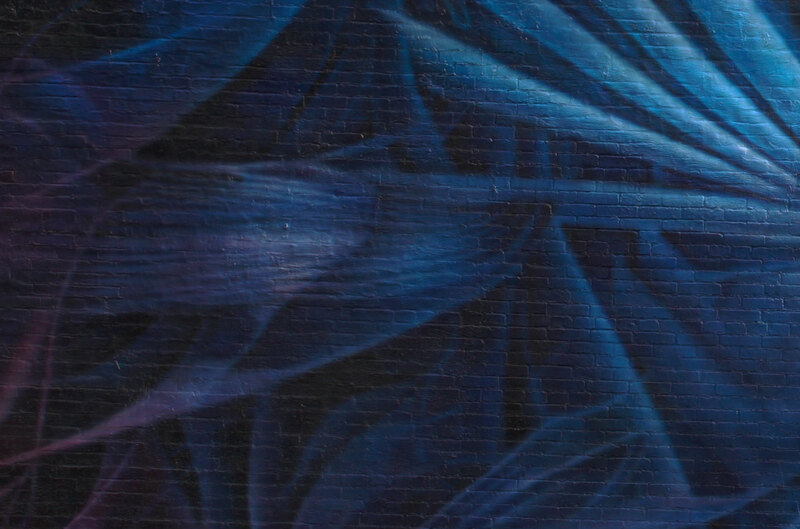 With the location being in such a public space and being seen by a variety of people, I started thinking about the word “spirit” and it’s meaning in different contexts to give the mural a more universal appeal. People of all faiths and beliefs would be viewing the work. The English word spirit comes from the Latin word spiritus, meaning “breath”, but also “spirit, soul, courage, and vigor”. I wanted the design to represent the incorporeal, ubiquitous and non quantifiable substance of energy present in all living things. The spirit of a person develops and grows as an integral part of a human being. When I think of spirit, I think of the energy that is alive within us that rises in perpetual motion. I wanted to capture the spirit element found in us during moments of inspiration that is always moving, changing and evolving. This is where the title came from. I thought “Elevate” was appropriate because it is the spirit that rises within us and takes us to new planes as we grow. The design for such an intangible subject lends itself to be abstract or representational. 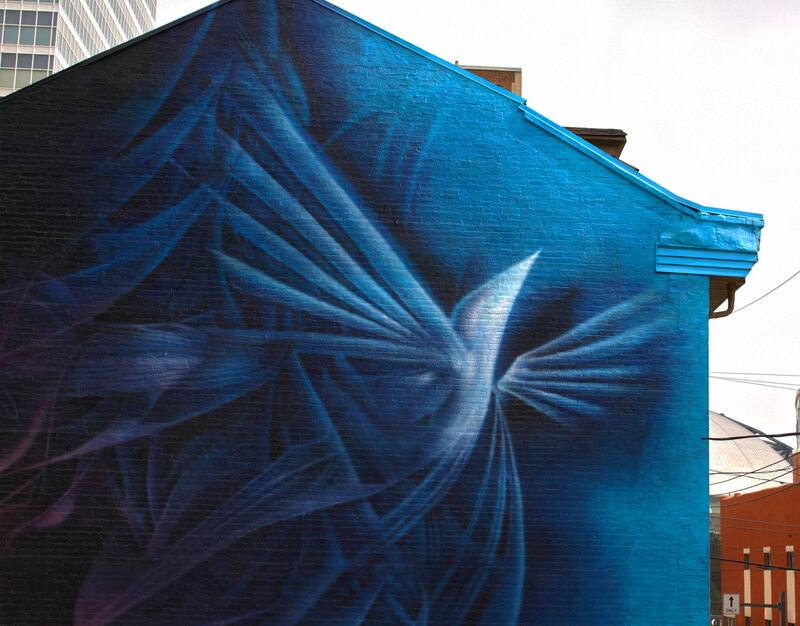 An air gun was used to paint the entire piece. 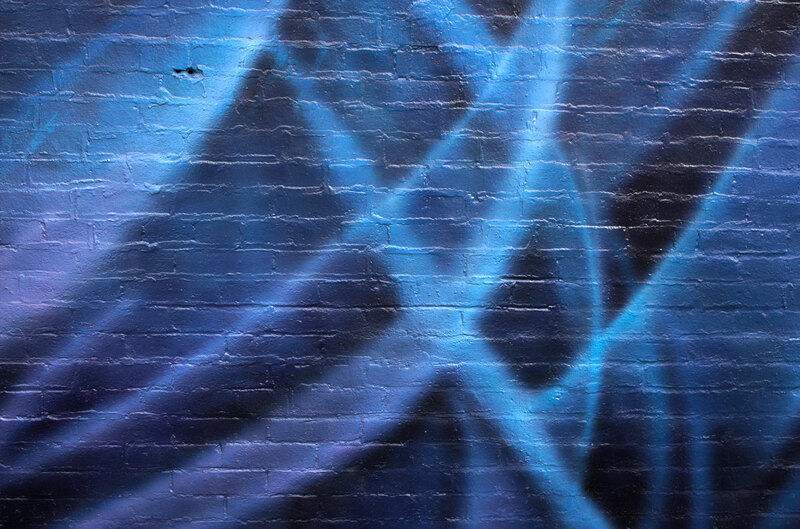 I wanted the design to capture the movement and incorporeal nature of the spirit is it elevates from below and felt that using an air gun would create subtle washes of color that overlap, blend and wash over one another, leaving no defined harsh edges. 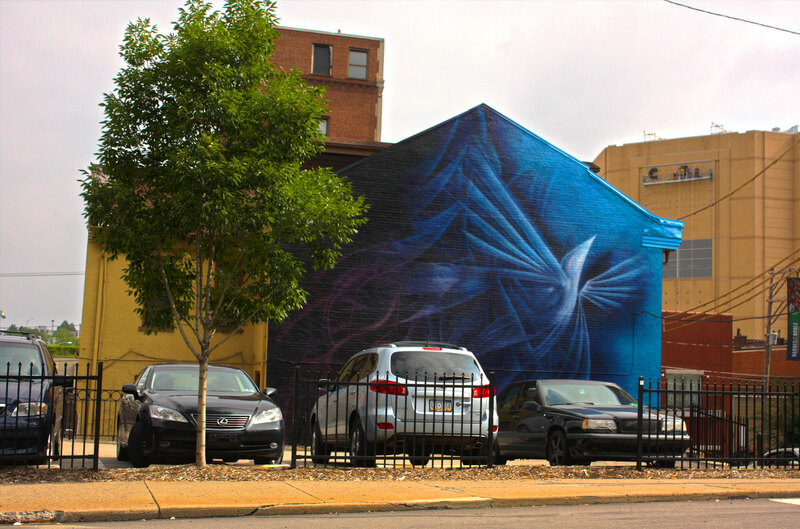 A wall obscures the bottom portion of the mural, which forms the parking lot in front of it. 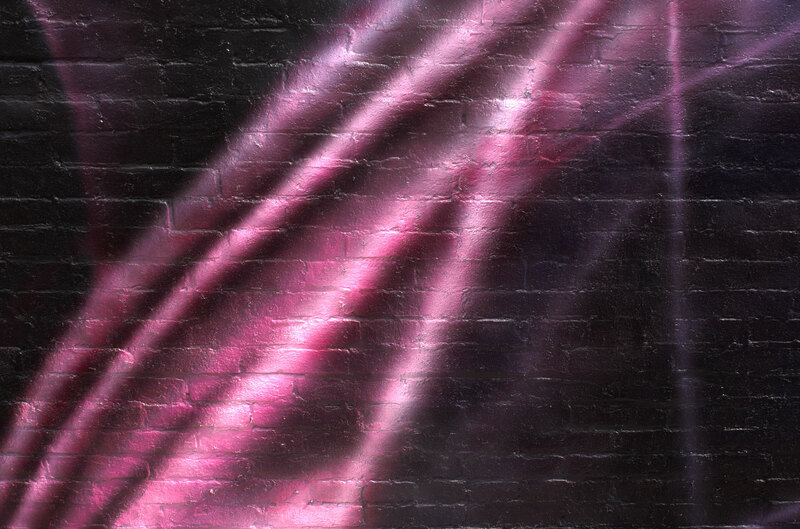 The spirit form rises from behind the lower wall and ascends to the upper right portion of the sky. The cityscape is seen behind the wall in the background. Working with the schools colors of blue, red, and white, the school symbol of the dove emerges out of a swirling form of saturated color to break free and enter the atmosphere. While painting one afternoon, someone stopped to ask me title of the mural came from. I said “I was really trying to capture a feeling of elation. I think we are all looking to hang onto those moments in life when we feel inspired, optimistic and elevated. That’s the point of living, isn’t it?” A few months after the mural was completed, I attended an event at the new Consol Energy Center close by. Passing the mural, I heard a woman say to her husband “What a great mural! Very uplifting!” I smiled and thought maybe I might have succeeded this time.